You’re splayed out on the large oriental carpet in front of the fire looking through all of your grandparent’s photo albums. Your grandmother smiles from her wing chair, a little aperitif in her hand. Your grandfather stokes the fire, gently pushing the embers around. He’s the one who teaches you how. He teaches you how to make things like fires and how to carve little wooden birds because you haven’t got a father for those things, have you? Brambles is their favorite restaurant, now. But you remember the early ones from Los Angeles, when you were very little. 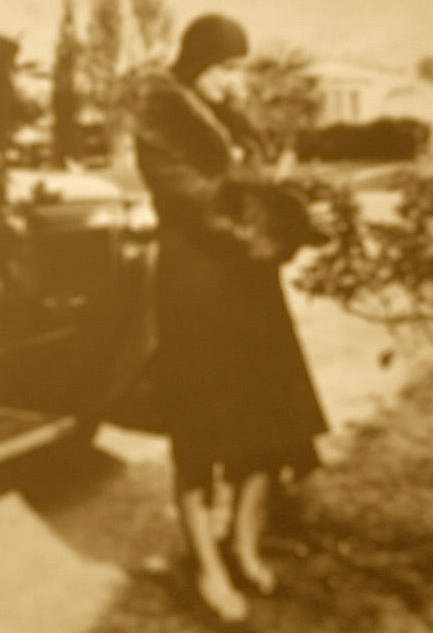 Teas in the tearoom on Wilshire, with your grandmother dressed to the nines and your little white gloves and hat. She’d take your hand. She’d choose the petits fours. She spends hours writing little notes to herself on how to be positive and spiritual. Your mother tells you that she has no life, that she had to give up everything for her children and she always resented that. Later you wonder whether that was true or not because she always seemed so happy. They had come to California during the Dust Bowl years, hadn’t they? In a fantastic car with a rumble seat. Your mother told you the stories about the tarantulas jumping as they crossed the desert. An entire branch of your family moved west towards the sea in those years. “One day these will be yours, dear,” she says as she teaches you about setting the table. She’s telling you the names of all the spoons and forks and silver tea things and glasses and which goes with which and showing you all the hand painted plates her aunt made, with sea scenes. Already she is planning some kind of dowry for you out of her antiques, as if there will be a continuity in you that your own mother broke once upon a time. As if you will carry the line in your family forward, somehow. Once you are married. Your grandparents never worked, did they? You think about this when you study art and see the faces in the photographs of that era. Your grandparents were part of some kind of gilded age in America where everyone danced the Charleston while people jumped out of windows in New York as the stock market crashed in 1929. “Jeepers, Creepers,” he’s singing to you as he dances you around the room. Your grandfather is teaching you how to waltz by standing on his feet in those years. It’s almost a whisper as he sings, looking into your eyes and beaming at you. There are charger plates and plates with golden rims and demitasse cups that sit in little silver mountings and they are so thin they are almost like eggshells. There are bone-handled knives and mother of pearl knives and endless spoons. There is formality in the quiet at their house. Formality in the way that Kipling sits comfortably on the shelf, in the way that you can sprawl instead of hiding under furniture, isn’t there? All your horse statues live there, too. Up at their house. At their house the things you do are valued and saved. You find them years later. It’s so strange to look at them, isn’t it? Little poems you wrote or little books you loved. Childhood. Where’d you get those eyes?” he croons. You’re all dressing for dinner because it is always like that, your grandmother with her rituals of perfume and dressing and her slantboards and her frownies in the afternoon as she rests after napping in the slanting sunlight spilling into her room. She teaches how to manicure your hands simply, pushing back the cuticles with oil and using a buffer. She has her hair done twice a week in a small salon. In her era women didn’t do their own hair. In your mother’s era either. She wants you to be a girl but you’re a tomboy, aren’t you? You’re riding horses with your friends, falling into the poison oak, chasing through the fields. It’s only in the afternoons after they have had tea when the day smooths out into evening and dinner. When your grandfather plays Chinese Checkers with you before dinner when it is all calm, the cocktail hour, a descended calm that you never feel elsewhere ever again. Your grandfather tells you he did too, for years. Camels. A sturdy kind of thing for a man. You think it later looking at the packages with the pyramids. Aunt Cece’s husband was traveling there, and they show you the pictures like so many tapestries of time she unfolds for you, sweeping her elegant fingers across an entire landscape of imagery. She’s proudest of her wedding ring and her engagement ring. She married at nineteen and she’s showing you her wedding dress all beaded and explaining the lace and even in her years much later she is still the flapper she must have been at twenty, you think to yourself. Marcelled. You saved it, didn’t you? It’s in a box at your house, or a trunk. Lost in time the way that things get lost. The beads are so fragile and heavy they weighed the lace down until it tore. It was that fragile like the wing of a butterfly, Smoky greige silk. White girls are supposed to get married. White girls are supposed to be like princesses when they do, aren’t they? Years later you remember your wedding day. You were working that week, weren’t you? You were his third wife so it wasn’t going to be a really big deal was it? You were just going to do it, very simply, at the Courthouse and that’s what you did. There was no honeymoon because your boss at work had said that no two people could be off the same week, hadn’t he? Later you will remember the grungy bowels of the newspaper where you were a proofreader with contempt. Not for the kind bosses you had, but for the evil ones. The ones who called you into their offices and made subtle threats as they pocketed everyone’s raises. You will remember how hard you had to work in those years and the terrible hours and there wasn’t any happiness and there weren’t any honeymoons were there? You’re looking at your grandmother’s tea things, years later. You’re in an antique store filled with the sorts of things that they had once upon a time. You’re thinking to yourself that ginger gars aren’t too hard to replace. Posted in Americans, book, feminism, feminist history, feminist politics, Generation Jones, literary, memoir, Second Wave feminism, sisterhood, SoCal, story, whitegirrrl, Writers, writing. Tagged Feminine, feminism, herstory, history, memoir, themes in, writing.